Part of any trip to France is all about the food, n’est-ce pas?! And Easter in Provence is no different. 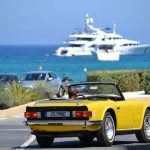 Many of you planning your holiday to our villas in Saint Tropez over the next few weeks will be also planning a few evenings out in the host of excellent restaurants in the area, I am sure. But it is also a wonderful experience to plan an evening in your rental property, all of which have excellent facilities in which to prepare a meal to remember with first class local produce. Bastide de Belieu, for example, has a fully fitted kitchen with access to its own wine cellar, with another summer kitchen outside just perfect for barbecuing lamb if the weather allows. And if you don’t fancy doing the cooking yourself, our team at St Tropez House will be able to help you find a professional chef to help you. Nothing says South of France more than starting off you meal with a glass of Pastis, which was invented not far from Saint Tropez, in Marseille, in 1932. The drink is served with water, and tastes of aniseed or Ouzo, the Greek equivalent. Serve with a selection of locally-picked olives. Although lamb is very popular at Easter time, we prefer to stick to a Provencal specialty which you would not find anywhere else. Daube is traditionally a peasants’ staple diet but it is now served in many a fine restaurant across the South of France. Slowly cook tender beef in red wine, garlic and herbs until the meat literally falls off the fork. Then serve with gnocchi and an excellent bottle of red. While nothing says South of France more than a glass of Pastis, no dessert is more Tropezienne than a Tarte Tropezienne; a light sugared sponge filled with delicious fluffy cream with a hint of orange. The famous cake was first baked by Alexandre Micka, a Polish baker who came to Saint Tropez in 1955. For more information on any of our St Tropez House properties available this Easter, including Bastide de Belieu or Kalliste, please go to our website here.